Our product range includes a wide range of stainless steel welded pipes and copper rods. We offer Stainless Steel Welded (ERW) Pipes in 304 Grade in various sizes in round, square and rectangular shapes. We can provide pipes in different polishes, i.e., grit 500 or 600. These pipes are used for home and furnishing such as doors, railings, furniture, hardware and kitchen storage. Our range of copper rods is highly acclaimed in market for 99.99% copper purity. 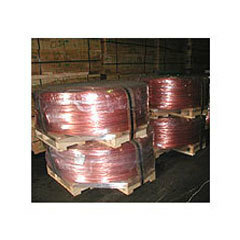 Our vendors make use of superior quality electrolytic copper enhancing its durability and usage. Packed in the form of coils, our 6.5mm rod weighs 300.00kg and 8.00mm rods weigh up-to 3.00MT Offered in diameter range of 6.5mm and 8mm our rods finds wide application in anodes, electrical engineering components (panels, earthing, electrification lines) and others.